Last week, at a financing round-table organized by the US-Ukraine Business Council (USUBC) – representatives from the IFC, EBRD, OPIC and US EXIM bank reaffirmed their commitment to financing projects and trade with Ukraine. They also demonstrated a whole host of very effective financing and insurance tools, available for use in Ukraine and other emerging markets. At the same event, these esteemed organizations mentioned multiple success stories and yet each only named half a dozen, or so, of the largest Ukrainian companies (a few were the same names repeated by several institutions). They also addressed fairly effective wholesale funding arrangements with local banks to serve local small and midsize businesses (SMEs). Yet, each of representatives has acknowledged a serious problem, which acutely manifests itself in Ukraine and in other emerging markets: lack of strong bankable projects in the $10-75 mil. range, a segment widely considered the main economic driver and job generator in emerging market countries such as Ukraine. Also noted were lack well-developed and bankable public sector projects in segments such as healthcare. Thus given widespread availability of interested project sponsors, along with multiple public financing tools and risk mitigation products, what can be done to bridge the gap and convert more deal concepts into real deals with realistic financing and true economic impact? (Astana, Kazakhstan)Yesterday, August 29th, President Nazarbayev of Kazakhsta n visited a newly opened Center of Tomography and Nuclear Medicine at the National Research Hospital in Astana the capital of Kazakhstan. Prime Minister of Kazakhstan Hon. Bakhytzhan Sagintayev and the Minister of Health Hon. Elzhan Birtanov were also in attendance. Broad Street Capital Group to lead an international Trade Mission to Uzbekistan. New York, August 26, 2018. Fresh from its success of developing a pioneering $250 million, 20-year OPIC insured, capital markets financing, Broad Street Capital Group announced today that it will lead an international Trade Mission to Uzbekistan between September 5th and 9th, 2018. The goal of the Trade Mission is to identify and engage large project development and financing opportunities in the areas of health care, distributed and renewable energy generation, agriculture, ICT and aerospace. such as Overseas Private Investment Corporation (OPIC), Broad Street Capital Group is uniquely positioned to bring low-interest, long-term financing to projects to be developed by the Trade Mission participants and supported by the Government of Uzbekistan. The mission participants will also introduce an innovative Grey2White™ initiative designed to assist local companies in becoming more bankable and transparent to western partners and international financial institutions. Joining Broad Street Capital’s team during the upcoming Mission will be representatives of US, UK and Israeli companies, international law firms and professional organizations. The delegation will be led by Mr. Alexander Gordin, Managing Director of the Broad Street Capital Group and will meet with a number of federal and local Government Officials, project sponsors and company owners in Tashkent. “Uzbekistan represents a tremendous opportunity for international project development and international business cooperation,” said Alexander Gordin. “Policies implemented by President Mirziyoyev have been very effective in attracting foreign investment, supporting technology transfer and focusing on growing key areas of the Uzbekistan’s economy,” added Gordin. 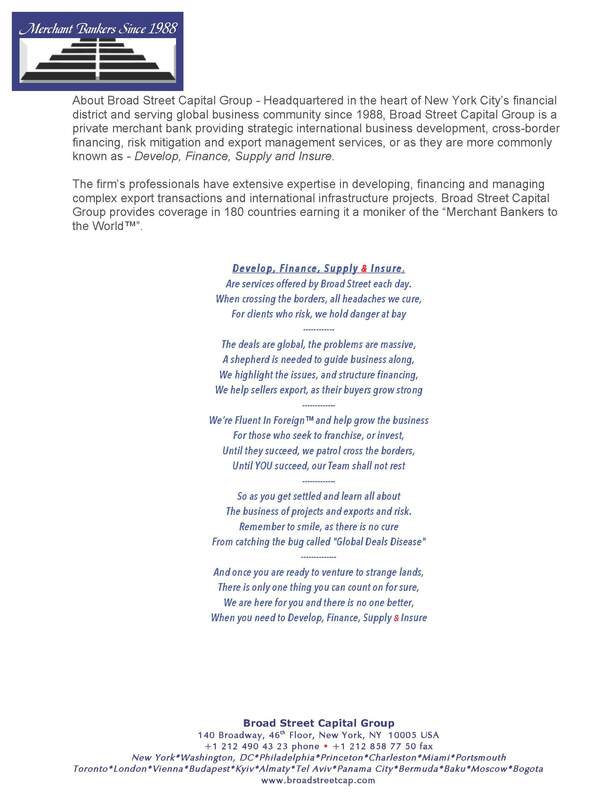 Based in the heart of New York City’s Financial District, Broad Street Capital Group (www.broadstreetcap.com) is an international private merchant bank, which since 1988 has served several foreign governments, multiple state-owned companies, as well as SMEs in emerging markets. Through its member companies, the Group focuses on developing project financing in the $100 million to $1 billion range, providing political risk mitigation, export management services and cross-border market development advisory. The Firm maintains a permanent presence in Astana, Kazakhstan and Kyiv, Ukraine. Since its founding, Broad Street Capital Group has done business in over 35 countries, spanning the emerging markets landscape from Bangladesh to Ukraine. The Firm works closely with all trade and development agencies of the U.S. Government and Export Credit Agencies of several European and North American countries. 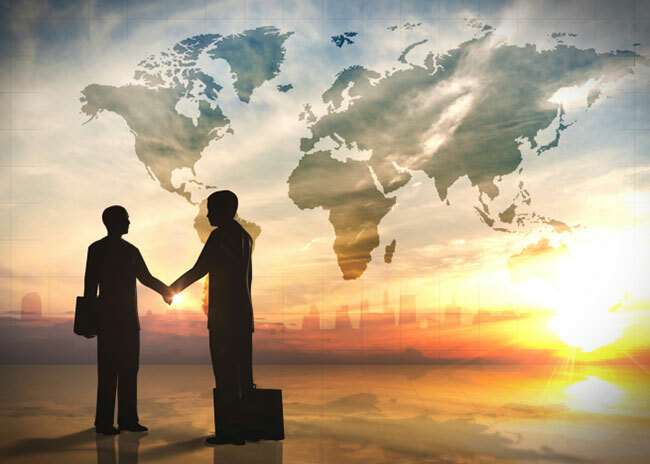 Since its inception, Broad Street Capital Group has been involved in multiple high-profile cross-border transactions in IT/telecom, aerospace, health care, energy generation, food security, nuclear safety, hospitality and franchising sectors. The firm’s current advisory and export management portfolio exceeds $900 million and expected to exceed $1.5 billion by November 15th, 2018. Broad Street Capital and GreenMax join forces in Africa. (New York, April 26th, 2018) Broad Street Capital Group and GreenMax Capital Group join forces to develop and finance large-scale energy projects in Africa. “We are excited to announce a new partnership with Broad Street Capital Group (BSCG), a New York based emerging markets focused merchant bank. BSCG has recently led a landmark transaction in Ukraine that is a game-changer for enabling financing of parastatal and direct state sponsored infrastructure projects. The facility is a US OPIC wrapped bond issue that for the first time offers 100% long-term debt financing at very low financing rates.” wrote Cliff Aron, Managing Principal at GreenMax. Owing to GreenMax’s strong Africa footprint and the company’s longstanding relationship with the Broad Street Capital Group, the Greenmax organization was selected to lead the introduction of this innovative financing product to the African energy sector. The minimum project size is $150M and the project must be implemented by a State agency, or parastatal. In the later case, the host Government must provide a sovereign guarantee. Broad Street and GreenMax plan to formally launch the product for Africa energy infrastructure at the Africa Energy Forum in Mauritius in June. The joint venture is seeking Power Africa sponsorship for this initiative and expects to be able to secure USTDA grant funding to support the preparation phase for any worthy projects. Although many countries in Africa will qualify for the financing being offered, projects in Nigeria, Uganda, Mozambique and South Africa will be of particular interest. Given Ukraine’s current economic and geopolitical situation, one of the most beneficial steps the US government, business and NGO community can take, is to encourage significant external and internal direct investment into the country’s economy. Although the US Government has had some success in attracting and supporting American direct investment into Ukraine, those investment amounts are far from sufficient. US investors new to the Ukrainian market are wary of the country’s reputation for corruption, difficulty in doing business, threats from Russia and lack of financing options. A second and much more viable economic development option, would be to support and enable direct investment by the successful Ukrainian business people who have amassed sufficient capital and are much more comfortable and adept in investing in their home market. One problem with pursuing that option are high Western standards, which often preclude US government development agencies and public US investors from working with this potential class of investors. This is due to the fact that for the last twenty-five years, practically all business people in Ukraine had to operate under a certain set of conditions widely considered “grey” and in many cases “black” in the West. Some of these “grey” conditions are lack of financial transparency, inadequate corporate governance, use of yellow press, use of cash, as well as offshore accounts to conduct operations, bribery and use of adverse political influence. In their attempts to succeed, some folks in Ukraine went beyond previously acceptable business norms and crossed the proverbial line even further by engaging in criminal “black” behavior – graft, extortion, corruption, tender rigging and illicit drug trade. To date, these grey conditions have presented significant challenges for the IFIs, development agencies and regulated financial US investors. Yet, it is vital to recognize the necessity to find an acceptable solution that allows Ukraine’s economy to reap significant benefits from the anticipated increase in direct investment and low-cost, long-term financing. It is also very important to understand that the proposed Grey2White (G2W)™ initiative aims to broaden and scale up very important development and capacity building work already undertaken over the last quarter century by IFIs, such as IFC and EBRD, USAID; development agencies such as OPIC and USTDA and financial investment communities. Those initial efforts, although quite effective, focused on a relatively small sample of Ukrainian companies and were undertaken during a different stage of the country’s development. The G2W™ initiative will only work with those companies and individuals, who will be able to create meaningful economic impact in Ukraine, after undergoing the conversion process. G2W™ will not in any way target those convicted of the “black” behavior, as their reputation gap is un-bridgeable within the scope of the project. Thus the question becomes, is it possible for US stakeholders to create an environment and a broad platform from which so-called “grey” Ukrainian businessmen seeking to utilize US financing, equipment, services and franchises, as part of their major investment programs, become “bankable” under Western standards? If the answer is “Yes.”This type of conversion will provide hundreds of millions, if not billions of dollars in direct economic benefit and enhanced geopolitical security to Ukraine and to the US. If the answer is “No,” these businessmen will either be forced to forgo the planned capital investments, or seek alliances with other grey, or black global actors in countries like Russia, China, Brazil, Iran, etc. It is the fundamental belief by the creators of the proposed initiative that given a concerted effort by the US and Ukrainian stakeholders to develop and implement realistic procedures to increase corporate transparency, introduce financial standards, address any existing reputation issues head-on and provide reputable outside management and board oversight, it is possible within short to medium time-frames to bring these so called “grey” businessmen and their respective projects up to elevated western standards, mitigate investment and reputation risks and affect substantial economic growth in Ukraine. Select three-four financially viable projects sponsored the “grey” Ukrainian actors and use them as a pilot to develop, refine and implement an effective conversion strategy to bring that project up to acceptable Western standards. From the government side, we propose to involve the US Commercial Service, USTR, US Embassy, Ukrainian Embassy, Cabinet of Ministers of UA, members of the US Congress focused on UA issues, OPIC, regional Governors and local administrations in Ukraine, IFC, USTDA and the US EXIM Bank (when that Agency resumes its activities in Ukraine). Among the NGO stakeholders we would like to see US-Ukraine Business Council (USBC), AMCHAM, Transparency International, Freedom House, Atlantic Council and US Ukraine Foundation. Additionally, reputable international law firms, audit firms, press, appropriate private individuals, corporate off-takers, financial market regulators, as well as relevant providers of US goods and services should be involved. To kick off the proposed initiative, we propose an intensive education and awareness-building campaign designed to simultaneously involve all the stakeholders. After the initial buy-in into the initiative is secured, work will begin on developing the pilot projects. Continue to promote the initiative and seek to move it from the pilot project phase to full-blown implementation. In the nine months since the above article was first published, a number of events took place, which not only validated the concept behind the Grey2White™ initiation, but also expanded its scope and attracted top notch global professionals to the program. Although initial premise of the program to convert grey actors in Ukraine to white bankable actors, whose economic contribution will greatly outweigh any possible transgressions they may have committed up to this point remains intact, the program has been expanded to include other emerging market countries of Eastern Europe and Central Asia. The program also grew to allow so-called grey companies to unlock their value through financial and legal transformation in order and become more bankable in the Western capital and financial markets. Part of this transformation involves tools, which on one hand provide increased political protection to the current management and to foreign investors, and on the other hand allow western companies to lock up predictable valuations and to observe the transformation process first hand. A first rate international “scrub team” has been assembled as a multidisciplinary team consisting of former US Government prosecutors, forensic accountants, legal and financial experts and last but not least, former high-level grey operator with deep expertise in shadowy government and business dealings in Ukraine and several other post-Soviet countries. A pilot company and its owner have been selected, as the first of four pilots companies to undergo Grey2White™ transformation in order to make them bankable by US Development Agencies for a $150 million project slated to create over 200 new jobs and to generate significant economic impact in Southern Ukraine. In the next 60 days. key members of the G2W™ Team are expected to travel to Latvia, Kazakhstan, Azerbaijan, Uzbekistan and Ukraine to conduct additional screening and selection of the pilot companies and individuals. In the subsequent parts of this article, we will examine the different case studies and watch the pilot candidates undergo the first steps of the Grey2White™ transformation. Fresh from its recent success, as the Financial Developer of the $250 million OPIC insured capital markets financing for NAEK Energoatom of Ukraine, Broad Street Capital Group has announced today that it will establish a $30 mil. Financing Feasibility Fund I (Fi3F™) – a global project development fund to provide feasibility grants and pre-financing development funding for qualified emerging markets’ OPIC-insured infrastructure projects to be financed in the US capital markets. The Fund will provide qualified Governments and State-owned borrowers feasibility seed funding in the amounts between $350,000 and $1 million dollars and pre-financing bridge loans in the amount of $1.25 to $2.5 million per project. 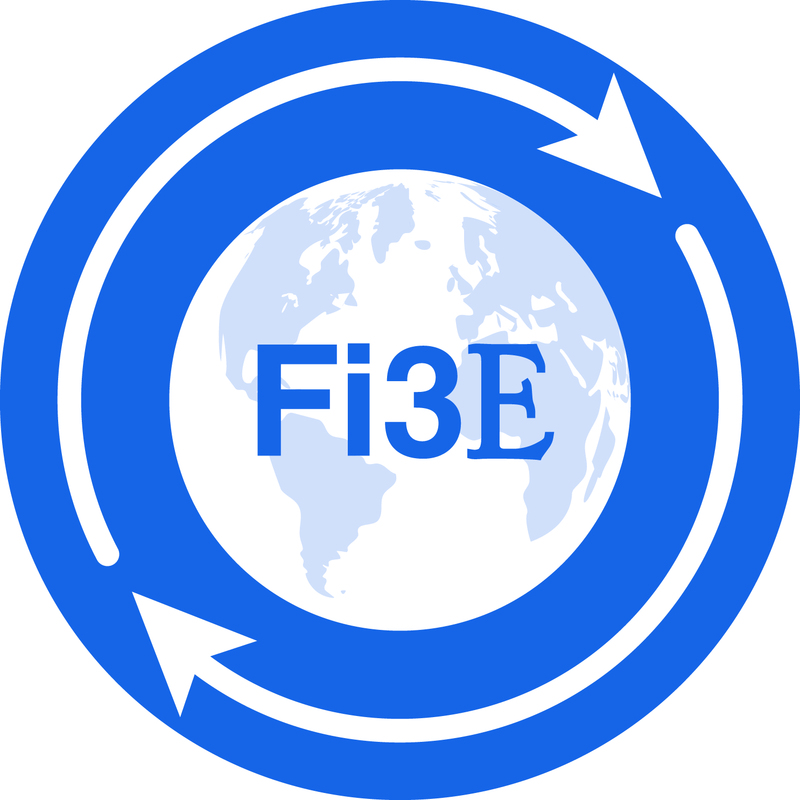 The Fi3F™ Fund will develop and seed international projects whose financing requirements fall between $150 mil. and $1 billion, and which will span the industry segments ranging from energy, airspace, transportation to agriculture, infrastructure and healthcare. The projects should be located in credit-challenged emerging market countries, which represent priority markets under OPIC’ development finance and insurance mandate. Financing terms for the projects will be between 10 and 20 years. A strong US supply nexus and willingness of the host governments to provide sovereign guarantees for the financing, will be key considerations during the project selection stage. Participation in the Fi3F™ will be open to qualified private and institutional investors, with at least 51% of all the shareholders being US nationals. The management of the fund will utilize proven project development techniques and will be administered by an experienced team consisting of leading legal, insurance and financial experts, a placement agent and the financial developer. The Fund will obtain Political Risk Insurance from OPIC to protect its funds and will retain a top tier investment bank to act the the Paying Agent to administer all the payments and disbursements. Fi3F’ returns are targeted to fall in the 12-17% range annually. Call for the first round of Financing Feasibility Proposals will commence April 25, 2018. 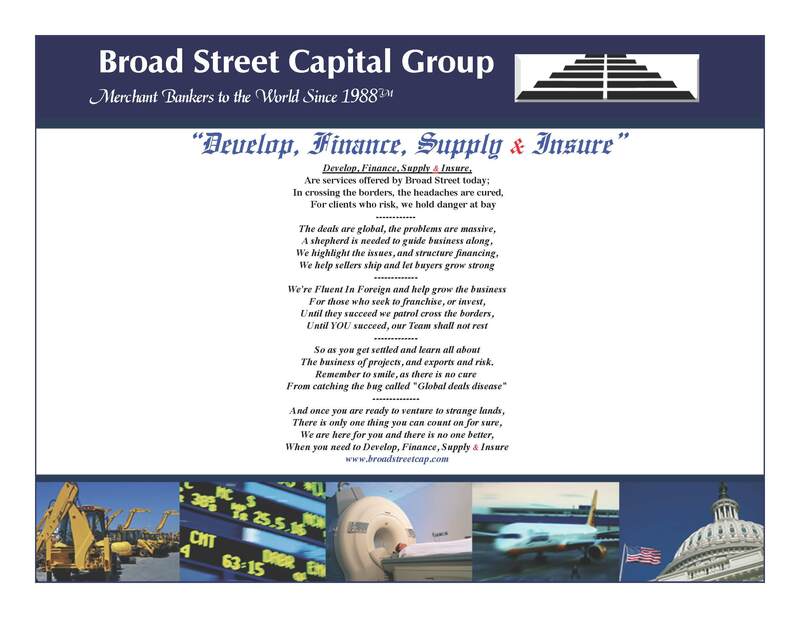 Based in the heart of New York City’s Financial District, Broad Street Capital Group (www.broadstreetcap.com) is an international private merchant bank, which since 1988 has served several foreign governments, multiple state-owned companies, as well as SMEs in emerging markets. Through its member companies, the Group focuses on developing project financing in the $100 million to $1 billion range, providing political risk mitigation, export management services and cross-border market development advisory. The Firm has done business in over 35 countries, spanning the emerging markets landscape from Bangladesh to Ukraine. The Firm works closely with all trade and development agencies of the U.S. Government and Export Credit Agencies of several European and North American countries. Since its inception, Broad Street Capital Group has been involved in multiple high-profile cross-border transactions in IT/telecom, aerospace, healthcare, energy generation, food security, nuclear safety, hospitality and franchising sectors. The firm’s current advisory and export management portfolio exceeds $417 million and expected to exceed $1.5 billion by November 15th, 2018. This announcement is for informational purposes only and does not constitute an offer or solicitation to sell shares or securities in the Company or any related or associated company. Any such offer or solicitation will be made only by means of the Company’s confidential Offering Memorandum and in accordance with the terms of all applicable securities and other laws. None of the information or analyses presented are intended to form the basis for any investment decision, and no specific recommendations are intended. Export Champions!™ With help of cutting-edge financing, four small and mid-size US companies are poised to export over $525 million of goods and services! With the help of cutting edge financing, four small and mid-size US companies are poised to export over $525 million in just three individual transactions! (April 23, 2015, Washington, DC) During US EXIM Bank’s Annual Conference, Export Champions!™, a new program, which allows small and mid-size US manufacturing companies to vastly boost their export sales by utilizing cutting-edge export credit and capital markets financing for international opportunities, was announced by the Broad Street Capital Group. 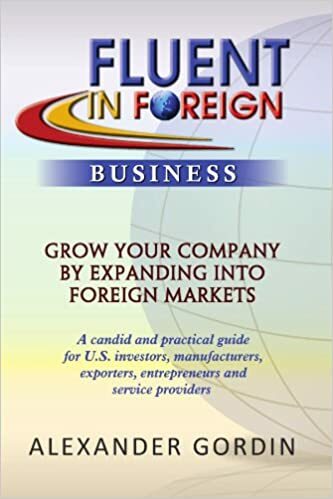 Using actual case studies of the three US companies, whose export revenues from just three projects total over $525 million, as the result of their foresight to deploy financing techniques traditionally reserved for large companies and mega projects, Broad Street Capital Group and representatives of various US Government and private trade and project financing institutions, will empower other US small and midsize companies to successfully compete for large export business opportunities. “Today, we are witnessing a paradigm shift in the way US small and mid-size companies are able take advantage of sales opportunities, which are two or three times their annual revenue.” said Alexander Gordin, Managing Director of the Broad Street Capital Group. “The key, is a carefully structured project, which is developed with specific long-term, low-cost financing solution in mind from the beginning” said Gordin. In my previous post, I outlined the first two steps of the five-step framework that would enable U.S. exporters to maintain their competitive edge in the face of rising U.S. dollar, which makes all U.S. goods and services more expensive abroad. Those first steps were to recommit to exports and expand markets served. 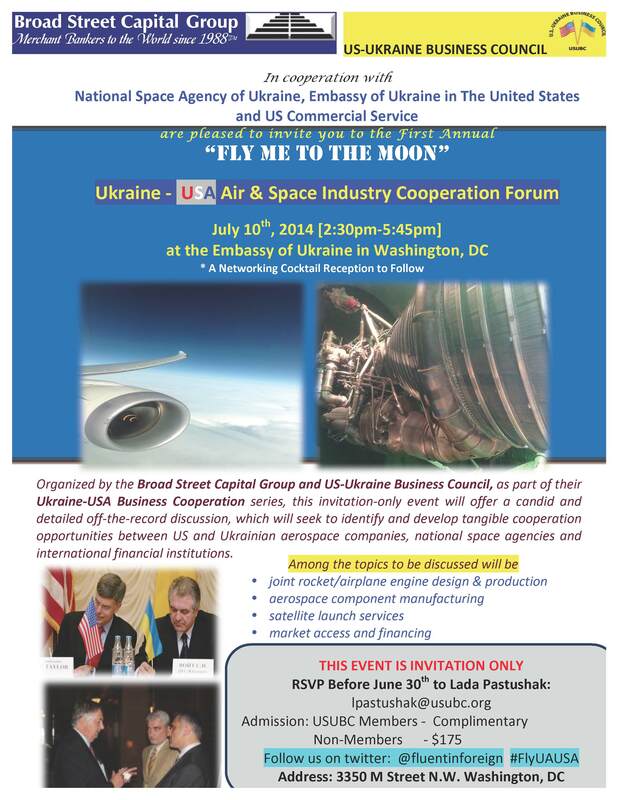 Do Not Miss one of the most anticipated Air and Space events of the year, as a high level delegation led by the Deputy Chief of the National Space Agency of Ukraine, presents Ukraine’s capabilities in the Air and space Arena and discusses cooperation options with US companies. Register Today!